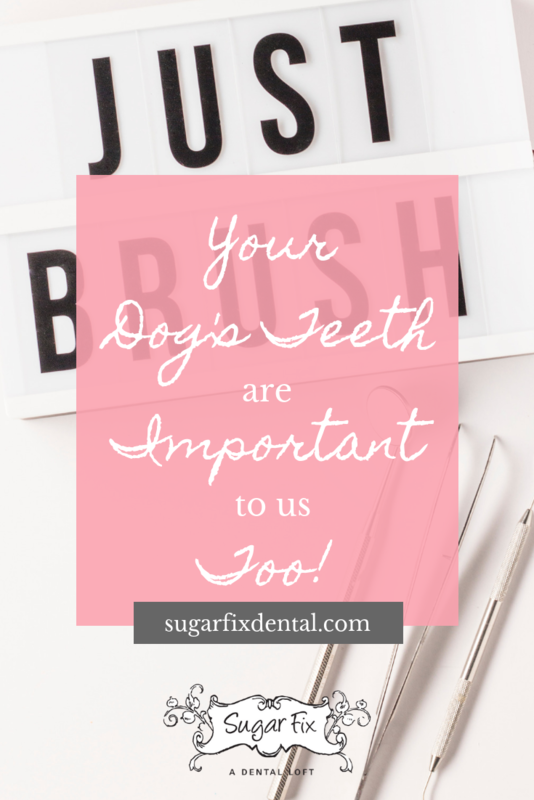 Your Dog’s Teeth Are Important To Us Too! We talk a lot about human smiles, but we also care a lot about your pet’s oral health, too! Dental care is important whether you have two legs or four, and just because they can’t hold a toothbrush or floss, that doesn’t mean your dog’s teeth don’t matter. Caring for your dog’s teeth — and making it a habit — is sooo important. Just like humans, poor oral health can have reaching effects on their overall health and their comfort. Not only can they lose their teeth, they can get infections that have the potential to spread throughout their body. It can even lead to heart disease — just like in humans. Do I Need to Brush My Dog’s Teeth? Yes! You do! Taking care of your dog’s teeth by brushing them regularly is the best way you can keep their teeth and gums looking, feeling, and smelling great. If you start when they’re little, they won’t think it’s a big deal at all, and they’ll quickly get used to it. According to the American Veterinary Dental College, a majority of dogs show signs of periodontal disease by the time they’re just three years old. Starting early is key! The first sign of a problem is bad breath. Unfortunately, many dog owners think bad puppy breath is just par for the course. If you notice your dog’s breath is unusually bad, it’s probably worth taking them into the vet to make sure everything is okay. Then, once you get home, start a new routine of brushing their teeth at least once a week! What Brush and Paste Should I Use? Use a wet canine toothbrush with soft bristles, you can also use a child’s toothbrush, a finger toothbrush, gauze around a finger or a washcloth. Pet toothpaste, often flavored like poultry, malt and other dog-friendly varieties, is your best option. Do NOT use human toothpaste, baking soda or salt. These can make them very sick. Instead, use pet-safe toothpaste with a flavor favorable to your dog’s taste buds. If your dog absolutely won’t tolerate a toothbrush, they do make tooth wipes. They don’t get in between teeth the same way a brush does, but they’re definitely better than nothing! They’ll remove plaque and are easier to manage than a toothbrush and paste if your dog is resisting. If brushing and/or tooth wipes are out of the question altogether, dental treats and chew toys can help. There are dental treats out there specifically made to help remove plaque buildup and can freshen their breath, too! If your dog is a chewer, get them a chew toy. The act of gnawing on them can actually help scrape plaque off your dog’s teeth. All-natural treats like cow ears and bully sticks can keep your dog not only healthy but super happy as well. If these options don’t work for your pet, there’s some great rubber and nylon chew toys on the market that can help without adding calories to their diet. Did you know that we keep a bowl of fresh water outside our doors for our furry four legged neighbors that pass by our doors? If you’re in the Lakeview area, feel free to stop in and say hello!